Target Audience: Fans of folk and faire style pirate tunes. Sad, sad ones. The thing about the band Marooned is that you should never listen to them while drinking rum. It’s not that they aren’t piratey – it’s just that alcohol can promote depression, and so can Marooned. Slow and somber, mostly a capella songs of death and despair, it’s best to stay sober lest you start blubbering into your mug. But even if you prefer your rum cut with the salty bitterness of your own tears, at least take a moment to hide the rope and razorblades. The album begins with Hoist the Colors, a song you likely recognize from Pirates of the Caribbean: At World’s End. Remember that scene where thousands of people are waiting in line to get executed, and so they all start singing? That scene that ends with a little boy getting his neck snapped at the end of a noose (classic Disney moment)? 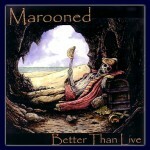 Well, this is the song that Marooned begins their album Better Than Live with, and it nicely epitomizes the CD. Strong yet soothing, like a demented lullaby, Marooned combines male and female vocals to lull you to nappy time where you will dream of oppression, torment, and a magical land where landlubbers mock you (Detroit.) It’s odd and strange, and thus not to be missed. The album continues with a mix of traditional shanties, some tracks that I believe might be from the renfaire side of the puddle, and even one or two more pirate-specific songs (including everyone’s favorite pirate anthem, The Derelict.) Of the traditional songs, Man O’ War for me stands out the most in that it’s a rare moment of Marooned sounding upbeat. It’s indeed a happy tale of how grand it would be to serve aboard a mighty warship. But *if* being the operative word, I suppose the singer does not actually serve on such a vessel, and most likely works in taxidermy. Which brings us right back to depressing again. Spanish Ladies, in contrast, is a song that is often considered peppy and festive, but Marooned leaves their indelible mark as they recreate the classical tune into one that is strong yet utterly somber. All this talk of depression might have you believing this album is best avoided – and if you suffer from mental or emotional instability, steer clear at all costs. But anyone with a healthy outlook on life and an ear for emotionally charged sea songs would do well to check it out. However, I’d be remiss if I didn’t address one greivance I have with the album, and this is regarding many of the songs which feature two lead males singing in unison [tasteless gay joke omitted]. A few tracks, in fact, feature this vocal duo (Cuckoo’s Nest, Watches, The Dutchman) which sounds less like two lead singers and more like a single vocalist with some weird reverb issues. To me the two voices don’t blend well, and result in a distraction from the songs’ more favorable qualities. I’ve never seen Marooned perform live, so I can’t state for a fact that this album is indeed “Better Than Live.” But it is a fine album that stands in stark contrast to the mounting selection of pirate rock, upbeat shanties, and rum-swilling party songs. This is a CD unafraid of tackling the innermost demons of shipboard and seagoing life. These are the songs you’ll sing softly through your tears as you find yourself shackled and hanging by your ankles in a Spanish prison, or while huddling from the cold in a drafty dockside tavern, your eyes burned from your skull by a captain with no sense of humor. So give it a spin, drink some rum water, and be glad that the dark days have not yet arrived. This entry was posted in Music and tagged marooned, pirate-folk by Bilgemunky. Bookmark the permalink.